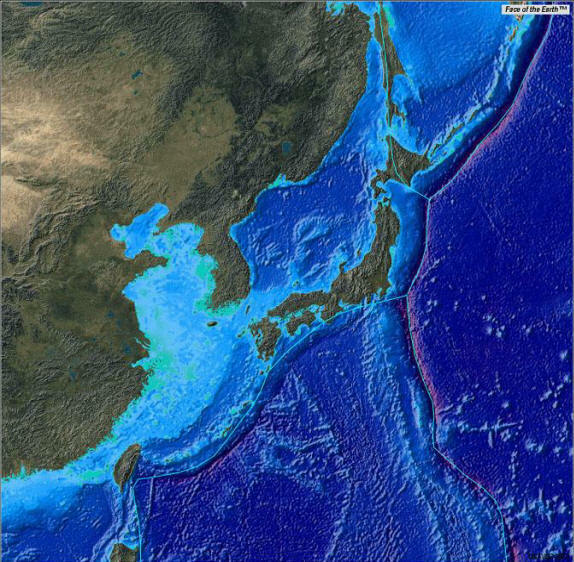 The western Pacific basin showing intersecting plate boundaries and sinusoidal subduction zones. As the Electric Universe theory suggests, arc-shaped geographic segments on other planets are the result of ion beams cutting into the surface. Evidence exists for a similar process on Earth. According to the vast majority of papers published by geologists, and also by planetary scientists looking into the evolution of other worlds, forces that are familiar to us all have acted to create the features that we see both on Earth and in those extraterrestrial environments. Earth has rain that is supposed to have formed the river valleys and filled the oceans over millions of years, so on Titan, for example, there must also be some kind of liquid and long periods of time to explain the perceived existence of channels and basins in a place where the temperature is hardly greater than space itself. The surface appearance of Jupiter's moon Europa is said to be the result of ice rafting and compression-cracking because the Arctic Ocean forms similar structures during its winter freeze. From that apparent similarity the theory of a Europan ocean has been educed, which has resulted in more theories about how liquid water can exist in a climate of less than minus 200º C. That line of thinking led to the theory of tidal "kneading" on Europa and from there to a decoupled crust of surface ice that obeys the mechanical laws of convection, expansion and subduction whenever its morphological development is discussed. The Electric Universe theory indicates that we should work backwards from the way that conventional geological thinking would have us do. Electricity permeates space and acts with great force over long distances. Previous Picture of the Day articles about the aforementioned moons Titan and Europa have described another mechanism for producing what satellite imagery has revealed and that is electrical etching. Therefore, rather than using Earth as a model for the Solar System and looking for questions to answer out there based on what we observe down here, we should use the Solar System as a model for Earth. If electric discharge machining was so violently involved with how the moons are shaped, then it might also have acted to shape the Earth. The Sea of Japan is another example of geography on Earth that is not easy to explain through standard models of planetary evolution. It is known as a "back-arc basin" according to the theory of plate tectonics. Continents slowly add new crust onto their margins when all kinds of subduction zone collisions take place. The western United States is supposed to have grown by a third or more along its boundary when it accreted many of these "exotic terranes" which traveled 3000 kilometers or more to build California and Nevada (probably parts of Alaska and Utah as well). Lesser continental collisions do not necessarily cause terrane accretion, but they assemble complex crustal formations by crushing together backarc basins and magmatic arcs over eons of time. The Sea of Japan is said to be an example of what happens when one of the basins becomes inverted and forms an arc-shaped mountainous island chain. For more information about the theory of plate tectonics and how the continents were created see the Colorado Department of Geology home page. There are characteristics that point to electric discharge machining as a possible origin for the Sea of Japan. The Galileo spacecraft sent back images of giant looping "fractures" on Europa called "flexi" that, in the case of Sidon Flexus, extend for over 1600 kilometers. The island chains that make up Japan and the Philippine archipelago merge with seamounts and other underwater ridges further to the north and south so that they sketch out a cycloid just like the cycloid rilles on Europa. In fact, the underwater component bifurcates and continues to exhibit sine wave structure until it dead ends just north of Australia. There are dual-ridge faults along the eastern edge of the Japanese coast that plunge thousands of meters deep into the crust. The same kind of "faulting" was also discovered on Europa (and now on Saturn's moon Enceladus), leaving Electric Universe theorists referring to them as "lightning trenches" cut into the surface rather than fractures from internal dynamics. Perhaps the deep ocean trenches on Earth were also sculpted by external lightning and not by cracks and stresses coming from inside the planet. Many Picture of the Day expositions have pointed to cosmic forces combining with the electric fields of Earth so that massive clouds of ionized plasma swept across the terrestrial lithosphere. Those ion storms cut canyons, raised continents, leveled mountains and vaporized billions of tons of rock and water – along with their attendant biota. 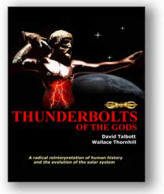 The power in those explosive events could easily have made the Sea of Japan at the same time it was forming the Mountains of Patagonia, the Zagros Mountains or the Scandinavian Peninsula.